A project meant to unite the communities exposes deep divisions on The Walking Dead. "The Bridge" takes place thirty-five days after Gregory's hanging. The Savior laborers work under Daryl (Norman Reedus), Carol (Melissa McBride), and Rick's (Andrew Lincoln) supervision. Tara (Alanna Masterson) monitors walker activity from a lookout. Jadis (Pollyanna McIntosh) and Father Gabriel (Seth Gilliam) get close. Maggie (Lauren Cohan) mulls several options at the Hilltop. Negan (Jeffrey Dean Morgan) finally makes an appearance. The Bridge begins with a voice over from Rick. He's telling a yet unseen Negan about their progress. At the bridge camp, King Ezekiel (Khary Payton) is saying goodbye to Carol and Henry (Macsen Lintz), who's grown quite a bit. He wants to stay, but the Kingdom needs him. Eugene (Josh McDermitt) and Rick discuss walker activity near the bridge. They've set up explosive rock slides and alarms to deter them. Enid (Katelyn Nacon) is stitching Cindy's (Sydney Park) hand in the medical tent. She's become Siddiq's apprentice. At the Hilltop, Maggie is breaking a horse. Michonne (Danai Gurira) rides up to discuss important matters. A delivery of fuel from the Saviors didn't arrive. Maggie will not give them food without it. Their fields remain unplowed without the tractor. They can't fix the metal plow because Maggie has imprisoned Earl (John Finn) for attacking her. Michonne pleads with Maggie to be merciful. Maggie refuses to budge. Michonne implores Jesus (Tom Payne) to help, but he firmly supports Maggie's decisions. At the bridge, Aaron (Ross Marquand) is telling Daryl about baby Grace. Henry is serving water to the Savior crew. Justin (Zach McGowan) wants more than his share. He throws Henry to the ground, who then gets up and knocks him over with his staff. Daryl rushes to Henry's aid and punches Justin. They start fighting. Rick and Eugene hear the commotion. 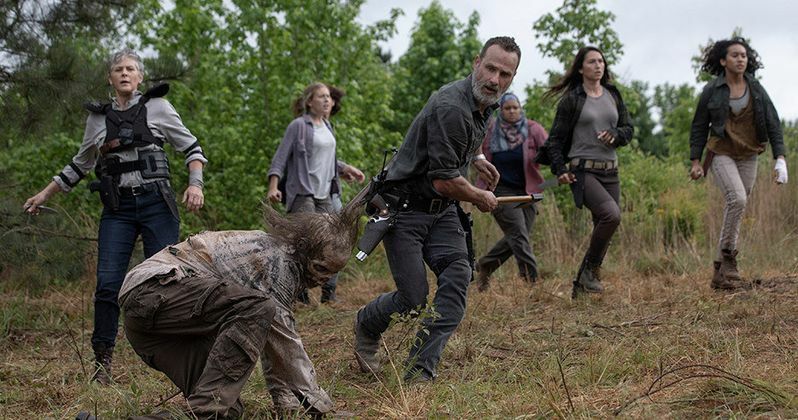 Rick breaks up the fight and demands everyone get back to work. In the command tent, Daryl is fuming at Rick. Rick tells him to keep it together, the Savior's are almost done building the bridge. Daryl replies there's only one way to deal with these people. Carol agrees to a point. Some people will never change. Daryl storms out of the tent. Tammie Rose (Brett Butler) confronts Jesus outside the Hilltop prison. She refuses to leave until Maggie allows her to see Earl. Michonne observes the entire confrontation. Again, Jesus will not go against Maggie's leadership. At the bridge commissary, Jadis is drawing a picture of a woman for Father Gabriel. He's impressed by how close it looks to the actual person. Jadis thanks him for being her friend, and allowing her into the community. Gabriel replies that Rick gave him a chance when no one else would. She gently takes Gabriel's hand. Maggie is playing with Hershel in her office. It's covered in paintings by Jadis. She's been getting letters from the Ohio community. Jesus asks if she would ever go there. Maggie replies that she's building the future here. He brings up Tammie Rose and Earl's imprisonment. He reminds Maggie that even though it's her choice, not everything she does is right. Maggie allows Tammie Rose to see Earl. She listens as Earl says he belongs there. He is ashamed for what he did. His wife weeps, claiming that god has forgiven him. Meanwhile near the bridge, Rosita (Christian Serratos) and Arat (Elizabeth Ludlow) set off explosives to direct the herd of walkers. Maggie decides to visit Earl. She asks him about his addiction to alcohol. He tells her how he stopped drinking when Ken was a baby. He was surprised that Tammy Rose stuck with him. Gregory got him drunk, but he was responsible for what he did to her. Maggie asks if she should have hung him too. Tara radios Rick from the lookout. The herd is moving towards the explosion. Rick radios Jerry (Cooper Andrews) for the second phase. Jerry turns on an air alarm. The herd moves towards it. Alden (Callan McAuliffe) approaches Rick. The Saviors who were supposed to deliver the fuel to the Hilltop never came home. They had families and children. As Alden and Rick argue about the Saviors being under his thumb, Tara radios back an emergency. The second alarm never sounded. The herd is coming towards them. Daryl and Aaron are loading logs with the Savior workers. Daryl sees the walkers approaching. He breaks off to take them out, but they're pouring towards them. The Saviors lose control of a log and Aaron's pinned underneath. Daryl defends his friend, but they are surrounded. Rick and the others come to the rescue. They start taking out the walkers. Rick shoots a rope holding the logs. They roll downhill over the remaining walkers. They lift up the log to free Aaron, his left hand has been crushed. Daryl races Aaron to the medical tent. Enid is on her own, Siddiq left to handle an outbreak in Alexandria. Daryl holds down Aaron. Enid saws off his crushed arm at the elbow. Daryl demands to know who was responsible for the second alarm's failure. It was Justin. He forgot to recharge his radio. Daryl attacks Justin with blinding rage. He's about to beat him to death when Carol and others pull him away. At the Hilltop, Maggie and Michonne discuss the need for common laws. Maggie has decided to give the Saviors the food, and release Earl. Michonne wonders why she changed her mind. Maggie replies that her father was an alcoholic too. He helped so many with his second chance. However, she has no regrets about killing Gregory. He blew all of his chances. That night at the camp, Justin demands that Rick keep his dog Daryl away from him. Rick has had enough. He throws Justin out of the camp. Justin has had enough as well. He's leaving immediately. In the medical tent, Daryl is filled with remorse over Aaron's hand. Aaron says it was worth losing to build the future. Various groups are sitting around the campfire as Rick observes them. Jadis asks Gabriel about the picture. The woman was the organist in his church. Jadis wonders if he took a vow of celibacy. Gabriel replies that he's an Episcopalian. They start to kiss. Around the fire, Carol puts on Ezekiel's ring. He wanted to ask on bended knee, but she doesn't want a speech. The scene continues in front of Negan's cell. Rick ends by saying the day was tough, but everyone came together. Negan laughs then mocks him. The whole thing will fail. Carl's death will have been for nothing. Rick yells he can never say that name, and that he will live his entire life in the cell. Negan replies that Rick is just getting the world ready for him. At the camp, Jadis is in the lookout at night. She stares up at the sky with a worried face. A dimly lit helicopter is high above observing them. The episode ends with Justin walking away from the camp drinking. He tosses the bottle before seeing someone he knows in the woods. He's yanked violently into the darkness. "The Bridge" was a solid, well written episode. The communities are slowly cracking at the seams. Several noteworthy events foreshadow the big changes to come. The first being that Maggie is still in contact with Ohio, and they are interested in her well being. I have a feeling the helicopter is from the New World Order. What happened to the missing Saviors and the fuel? Who snatched Justin? Are the Whisperers coming? Tune in next week to AMC as The Walking Dead's tensions at the bridge get worse.